There are many snacks/desserts referred to as coconut candy but the sweet chewy Coconut Candy discussed here is the one we make in Nigeria. Though some work goes to grating the fresh coconut meat into tiny pieces, the snack itself is very simple to make. Break the coconut, making sure to collect the coconut juice from it. Remove the meat from the shells and grate the meat into small pieces. I use the smaller openings on this grater for this task. Make sure to grate along the meat of the coconut rather than across it. 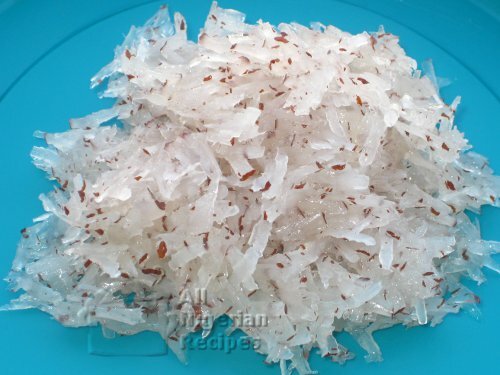 This is so that you'll have long thin coconut pieces rather than a mass of grated coconut. Pour the coconut juice into the pot. Add the icing sugar (powdered sugar). Stir. Add the tiny coconut pieces and stir. 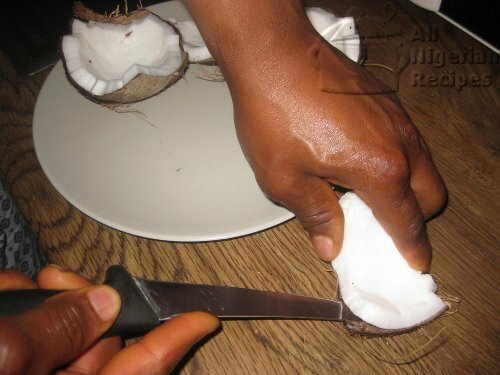 Add water to the same level as the coconut pieces. Cover the pot and set to boil at high heat. Once the contents start boiling, stir continuously till all the water is just about evaporated. Reduce to low heat and continue stirring. At a time, you will notice that the contents have started sticking together. That is the sugar caramelising. Keep stirring till the coconut pieces start turning slightly brown. Turn off the heat and scoop the very hot coconut candy onto a flat plate and leave to cool down. The coconut candy should be sticky when cold. It should not be dry. You can store it in the freezer for up to a month. This is supposed to be a very sweet snack that is why all that sugar is used in the preparation but feel free to reduce the quantity of sugar. The caramel from the sugar can be tough to wash off the pot when it has cooled down. The best way to wash this off very hot water as soon as you are done with making the snack. Once cold, you can serve as dessert or eat it as a snack.